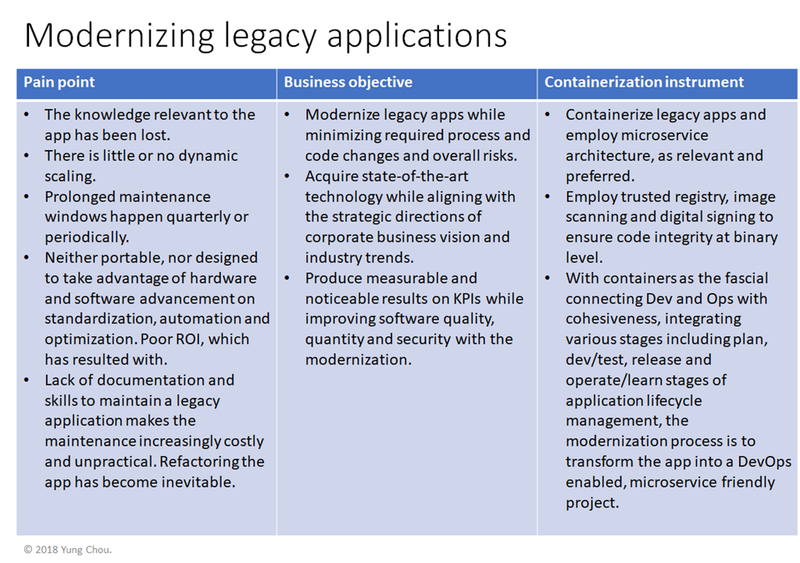 The term, containerization, here denotes not only packaging an application as a container, but practicing DevOps and employing container artifacts to generate container images and instantiate instances accordingly throughout an application lifecycle. 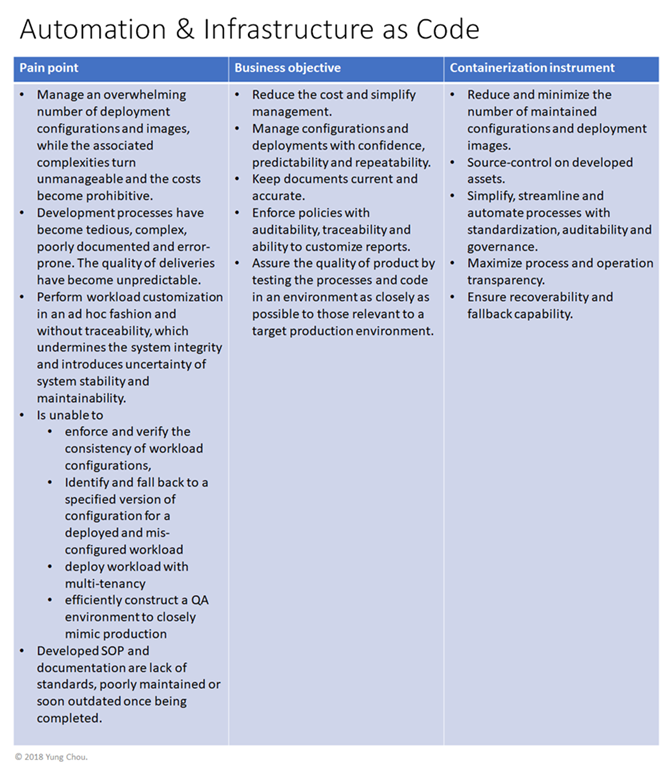 The following is a list capturing some pertinent information on containerization. There are a number of use cases that containerization may play a significant role as show below. And I use a 5-step process flow to depict the concept of software supply chain with containerization. 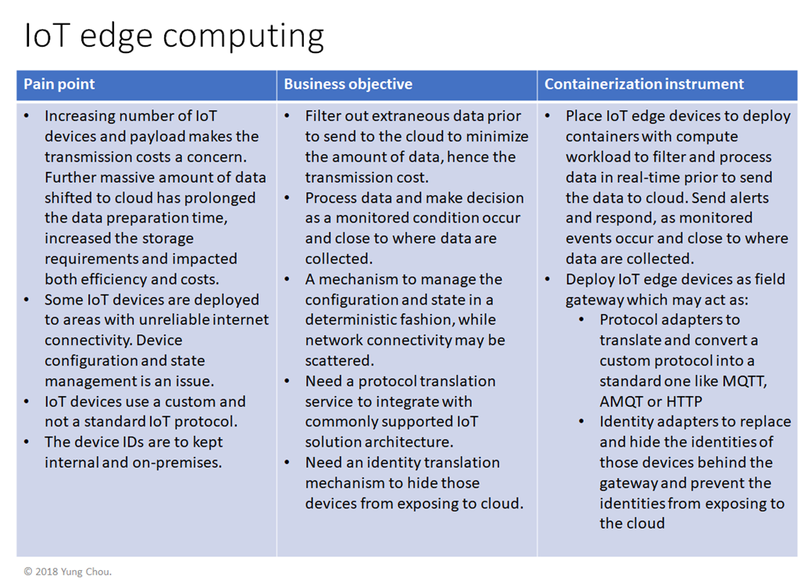 Here, for each use case I highlight the issues and concerns, what business may pursue, and how containers may help address the problems. It is crucial to first get a clear vision of what the problems are and achievable goals. Frankly, there is always a solution for a problem. Depending on the available resources, how bad and how soon it needs to be done, the path to Rome may vary. 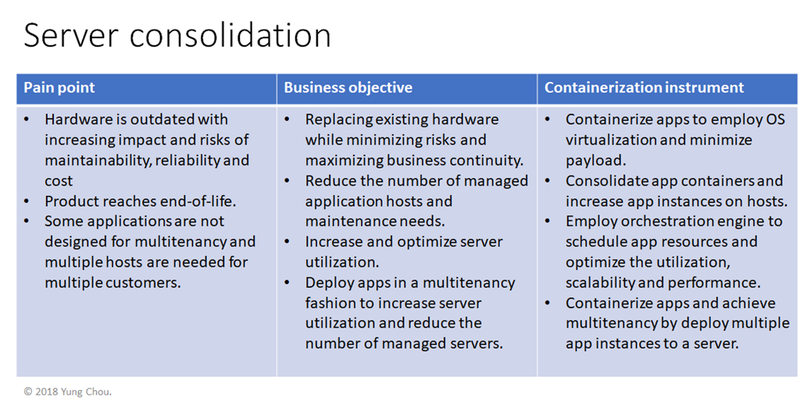 Containerization is not an one-for-all solution. Equally important is to determine what to measure and do benchmark current state before implementing changes. Containerization can and will change how you deliver services. There will be noticeable and fundamental impact on organization structure, company culture and team dynamics. 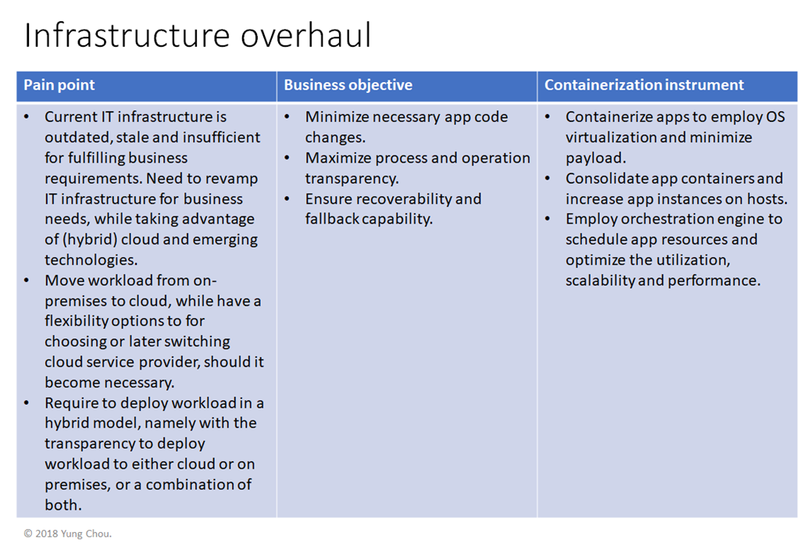 Further containers-based deployment is for speed and scale. From the surface, changes made may initially appear disorganized, chaotic and without governance. Many will question the manageability and feel discomfort since containerization like DevOps, microservices and other emerging technologies are indeed different and disrupting. Therefore, realizing the ROI becomes even more critical. A project team must determine and get agreements with stake holders on KPIs, track them closely, report often to prove the business benefits early. Doing so,will not only improve the quality delivered, but drive consensus, strengthen the confidence and help validate and align with business goals. 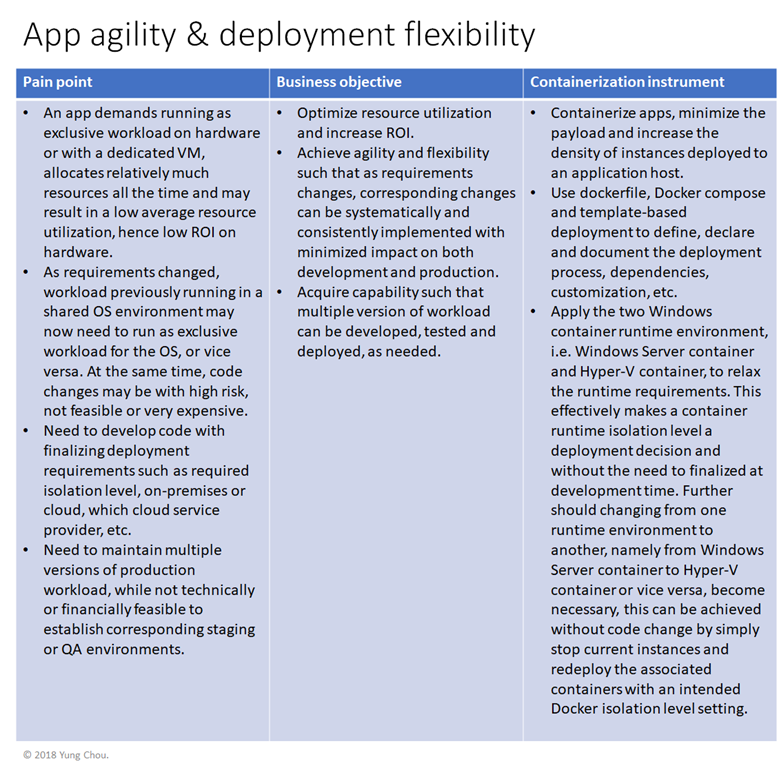 Regarding containerization relevant to microservices architecture, not only most of the listed use cases are also contributing factors, but microservices architecture is a topic by itself and there has been much material already published and available online. It is included here for completeness and I will leave microservices architecture for the reader to investigate. Containerization is a technology backed up by Google’s years of implementation experience and strong credit. The adoption in IT industry has been aggressive and skills of Docker containers are becoming commodity like tcpip, virtualization and cloud. Identifying use cases and defining KPIs are in my view essential before implementation. Hope this article provide some values for achieving these tasks. 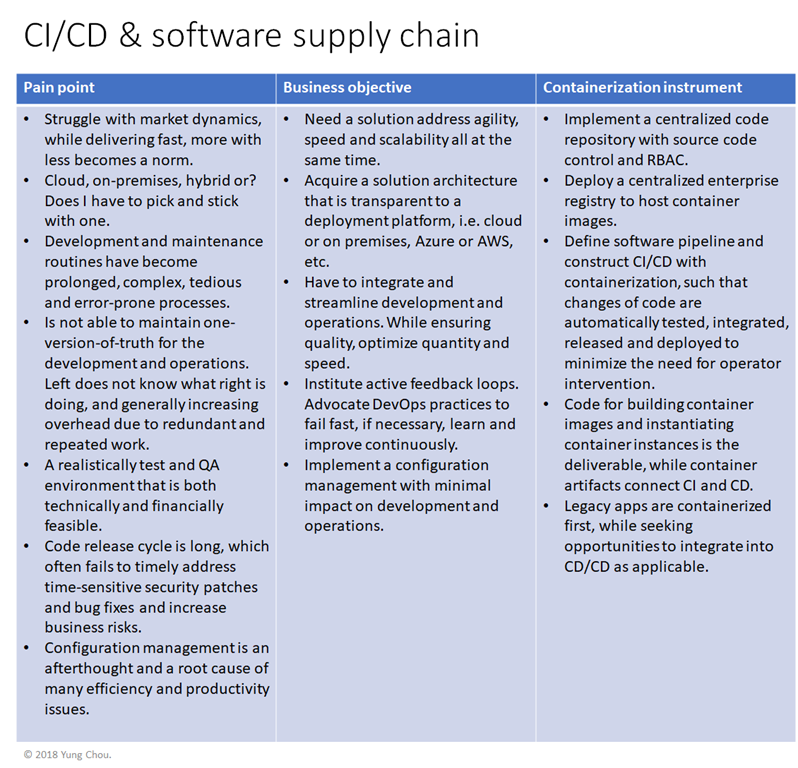 In my next blog, I will address more on a secure software supply chain with containerization which also have mush relevance to microservices architecture. Stay tuned.